Candles are an essential addition to many homes. Be careful where you leave your candles in the house, though. A curious dog may not be able to resist eating a candle if they come across it. Will eating a candle make my dog sick? No, the wax used to make candles is not toxic, so a dog will not be in immediate danger. Keep an eye on your dog, though, in case they have a secondary reaction. Just because candles are not toxic doesn’t mean that they are harmless to dogs. A candle contains more ingredients than just wax, after all. Many of these could cause an allergic reaction or other health problems. Read on to discover how eating a candle could affect your dog. 1 Should I Call the Vet if My Dog Eats a Candle? 1.6 Why Would a Dog Eat a Candle? 1.7 What are Candles Made Of? 1.10 Will My Dog Pass a Candle Naturally? 1.11 Should I Make My Dog Throw Up When They Eat a Candle? 1.12 How Do I Stop My Dog from Eating Candles? Should I Call the Vet if My Dog Eats a Candle? Disorientation or a lack of coordination. Reluctance to eat or drink. Severe burns from the candle flame. Visible signs of pain and distress, such as whimpering or pacing. Also, some types of candles are more dangerous to dogs than others. Tea lights are small so, in theory, your dog will be able to pass them. This is easier if your dog is a larger breed. Toy dogs are more likely to experience a problem as their stomachs are smaller. The problem with tea lights goes beyond just the wax, though. If your dog has eaten the metal base, they may experience further problems. This could take the form of dental issues or stomach pain. Keep an eye on your dog and act quickly if they show any signs of discomfort. Scented candles are arguably the most dangerous styles of candle for your dog. These items will often contain perfumes and essential oils that could cause an allergic reaction, and the aroma may attract your dog to them. Some also believe that fumes released by scented candles can cause health problems in dogs and humans. Soybean or beeswax candles will minimize this risk. If your dog tends to eat everything in sight, think twice before picking up a candle with particular scents. The flipside is that most of these scents can also benefit your dog. Some of them have a calming effect, and others aid digestion and the immune system. Essential oils can be problematic for dogs, but there should not be a dangerous amount found in a scented candle. All the same, keep them behind a barrier where possible. If your dog can enjoy the benefits without placing himself or herself at risk, everybody wins. 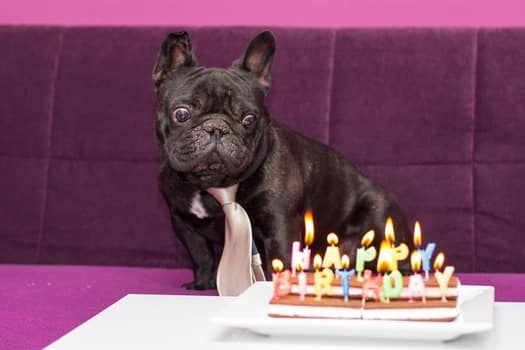 Birthday candles may appear irresistible to your dog, so you’ll have to be careful with these. They will be attached a cake, which will be appealing as dogs love the smell of processed sugar. Add the noise of humans gathered and singing, and you have a recipe for an excitable canine. Thankfully, birthday candles are small. This means that a dog will find them easier to digest and pass through their colon. 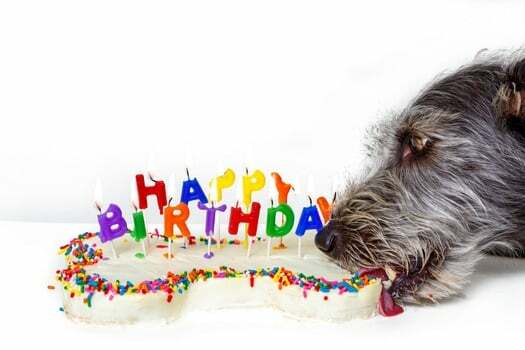 If your dog chews a birthday candle first, they are even less likely to suffer. Of course, this does not mean that you should allow or encourage this behavior. If your dog manages to grab a cake candle while your back is turned, don’t panic. They are more likely to grow sick if they start eating the cake. Soy candles are the closest thing to dog-friendly candles. This does not mean that there will be no repercussions from eating such a thing. However, your dog will not grow sick by inhaling the fumes. However, just like any other, your dog will struggle to break a soy candle down in their stomach. This means that, if they swallow it whole, there could be problems further down the line. As always, keep a very close eye on your dog after such an incident. If they start to vomit, struggle to settle or show other signs of discomfort, you should take them to see a vet. There are lots of different scented wax melts on the market that has a similar impact to candles. Most of them are scented and thus make a home smell great. We have to be just as careful as we would be with a candle, though. Wax melts are not better for your dog to eat than a candle. Take a Scentsy wax bar, for example. These tend to be small, so on paper, they are less dangerous than a candle. However, all the usual caveats of warning about scented candles apply here. There may be all kinds of perfumes and additives at play, any of which could harm your dog. A melted Scentsy wax bar, or other kinds of wax melt, will also be very hot. Be vigilant about keeping these away from your dog, as they could burn their mouths. If your dog laps and licks at melted wax, damage to their tongue or lips could follow. If this is the case, follow our advice elsewhere in this article about managing burns. Why Would a Dog Eat a Candle? It may seem a little strange to imagine that a dog would eat a candle. There could be many reasons why, though. Your dog is hungry and seeking anything solid to eat. Your dog has a nutrient deficiency and is hoping the candle might help. Your dog is attracted to the smell of the candle and is exploring with their mouth. Your dog associates fire with warmth and comfort, so thinks the candle is a treat. Your dog has never seen a candle before and wonders how it tastes. All of these reasons are why you should always keep your candles high, or behind glass. Dogs that can reach candles with their mouths, or knock them over with their tails, are at risk. Whether they’re eating the wick or causing a fire hazard, dogs and candles should not mix. The body of all candles is made up of wax. This could be constructed from paraffin, soy or beeswax. None of these are toxic to a dog, but they can be hard to break down. The wick that you light in a candle is usually made of braided cotton. This is not toxic to a dog. Many dog toys are constructed from this material. Some particularly eco-conscious manufacturers may also use paper. Lead candlewicks have been banned in the USA for nearly fifteen years now, so this is not a concern. Some candles feature chemical preservatives, such as benzyl benzoate. These chemicals are found in such small quantities that they should not harm your dog. Some vets use benzyl benzoate to rid dogs of parasitic infections. If you have a scented candle, there could be a variety of perfumes or oils included. Different oils will have different impacts on dogs. Some of them are poisonous. Of course, it is not just toxicity that you need to be cautious of in candles. 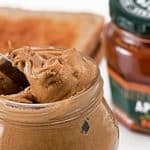 Any of these ingredients could spark an allergic reaction in your dog, too. If you suspect that your dog has an allergy, speak to your vet. Also, a dog attempting to eat a lit candle could also burn on the mouth, lips or tongue. Burn wounds can be serious for your dog. This goes double if inflicted by a lit candle that your canine attempted to eat. This would potentially leave your dog with burns to their face, tongue or nose. Your dog explores the world using taste and scent, so this will have a severe impact on their quality of life. If your dog has burned himself or herself while eating a candle, you’ll need to assess the damage. First-degree burns will leave the skin intact and are primarily superficial. This means that your dog may singe their fur, but will do not do any permanent damage to their skin. Call your vet for advice in the event of a first-degree burn, but stay calm. Second-degree or third-degree burns are more dangerous. These are burns that scorch through the skin and may cause permanent scarring or worse. Second-degree and third-degree burns are also painful and could leave your dog in shock. It is unlikely that a candle could do such damage, but if so, take your dog to a vet immediately. Remove your dog from the dangerous area. Ensure that the fire has been extinguished. Apply cool water to the burned area. You could use a showerhead for this, or just a jug. Do this quickly. The faster you act, the less likely permanent damage becomes. Apply something cold, such as a bag of frozen peas, to the area. Hold this for around 20 minutes. This is designed to reduce any possible swelling. Be particularly vigilant about looking out for symptoms of shock, which can be life-threatening to dogs. Very slow heart rate and weak pulse. Uncharacteristically cool temperature, especially in the paws. Uncharacteristic lethargy, and lack of interest in eating or playing. Do not hesitate to get your dog to the vet in such circumstances. Also, seek help if your dog seems reluctant to eat or drink, or cannot settle. They may need a painkiller, which your vet can provide. Take a cotton ball or pad and coat it in baby oil. Rub this all over the wax in your dog’s fur. This will loosen up the wax. Brush the impacted area of your dog with a wide-toothed comb. This should remove the vast majority of the wax. Give your dog a bath with shampoo to clean out the remainder. Don’t ignore melted wax in your dog’s fur. It will harden up and become increasingly difficult to clean up over time. The sooner you act, the more likely you are to resolve the problem. Will My Dog Pass a Candle Naturally? This largely depends on how much of the candle your dog ate, and their digestive system. Candles are difficult for a dog’s stomach to break down, which could cause problems. Refusal or reluctance to eat. Visible signs of pain, such as pacing and whimpering. If your dog is struggling with their intestines after eating a candle, see a vet. A professional will be able to run further tests and scans and take the appropriate action. This may take involve a laxative, which will encourage your dog to pass the candle. It is not advisable to feed your dog a human, over-the-counter laxative though, as they may react badly to this. Leave any prescriptions to the professionals. Tinned pumpkin from the supermarket may speed everything along, though. In some cases, your vet may need to resort to surgery to remove the candle. This could be a small, keyhole procedure or a larger operation. It all depends on the size of the candle, and the impact it is having on your dog. Your vet will decide upon the best action and discuss the options with you. Should I Make My Dog Throw Up When They Eat a Candle? You should only do this is if your vet recommends it. 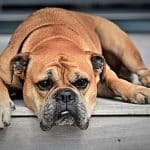 Induced vomiting in dogs can be very dangerous, even under the guidance of an experienced professional. Also, vomiting will only be effective if your dog has recently eaten the candle. If more than an hour has passed, the candle has passed through your dog’s throat and into their digestive system. If your vet instructs you to enforce vomiting in your dog, you should follow their advice and instructions closely. Never put your fingers or another foreign object down a dog’s throat. This could cause your dog a great deal of distress and pain. As a result, your dog may bite your hand or fingers in the act of self-defense. If your vet does tell you to induce vomiting, they will recommend hydrogen peroxide. This can be purchased from any pharmacy or supermarket, and fed to your dog at a ratio of 0.5 – 1ml for every lb. of weight to make your dog vomit. However, as candles are not toxic, your dog may consider this to be an unnecessary risk. As we have previously stated, only attempt to induce vomiting in your dog if your vet recommends it. How Do I Stop My Dog from Eating Candles? The simplest method is to keep candles out of your dog’s reach. Never keep candles anywhere near your dog’s food, water, bed or toys. Keep all candles on a high shelf. Remember that dogs can knock things over by jumping or swishing their tails. Avoid scented candles that will be particularly appealing to dogs. Consider a citrus scent, as this will deter your dog. If possible, add an extra layer of protection. Placing your candles behind glass or a barrier will give additional peace of mind. Any time your dog approaches a candle, gently instruct them to walk away. Use the short, sharp, “leave it!” command if necessary. Finally, never leave a lit candle unattended. If your dog enjoys sitting by the fire for warmth, they may misunderstand a candle’s purpose. Dogs are similar to children in that they can find candles to be very dangerous. Do not take any chances. Stay safe, and keep your dog out of any potential trouble, by keeping our candles out of canine reach. There is no such thing as a safe candle for your dog to eat. All candles will come with the same risks of obstruction or choking. However, some candles are less likely to cause additional health problems. Soy or beeswax candles, for example, are almost entirely devoid of chemicals. This means that they will not release anything into the air. As a result, your dog is less likely to experience an allergic reaction through inhaling any smoke from the candle. If you have any doubts, check with a vet and manufacturer before purchasing candles. There is nothing to gain by taking any chances. Dogs and candles can make for a volatile combination. We sometimes make the mistake of thinking that non-toxic means pet-safe, but this is not the case. Candles can cause your dog health problems if eaten, and such an incident must be taken seriously. Just remember not to panic if your dog does eat a candle. That will only raise your dog’s hackles, and make things worse. Take stock of the situation, and call your vet for advice. Your dog will almost certainly not be poisoned, and thus will rarely need immediate attention. It will usually be a case of monitoring them for any adverse reaction. All the same, prevention is better than cure. If you can keep your dog from eating a candle in the first place, you will all be happier. 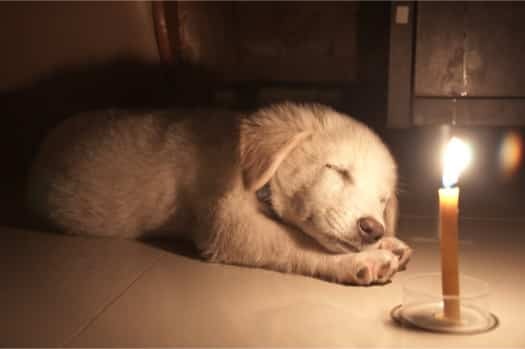 Keep everything connected to candles out of reach, and teach your dog that they are not food. If you can cancel out natural curiosity and instinct to eat, you will have no concerns.